Since both 11- and 12.9-inch iPad Pros are equipped with the same A12X Bionic chip, we're going to use the 11-inch model for this test. We're also not using the 1TB of storage model that packs 6GB of RAM instead of the usual 4GB, but we acknowledge that if you've got over $1,500 to spend on the most expensive model, you can expect a little bit better performance overall. 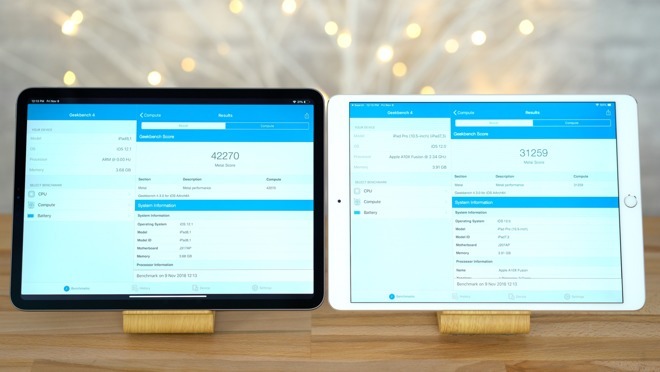 Starting with Geekbench 4's CPU benchmark, the 11-inch iPad Pro achieved a single-core score of 5,028, compared to 3,976 on the 10.5-inch model. In multi-core, the 11-inch Pro scored 18,181 compared to 9,555 on the 10.5-inch iPad Pro, matching Apple's claimed improvement of 90 percent. While benchmarks across radically different hardware platforms isn't a straight-across compare, the new iPad Pro benchmark score nears that of the best processor option in the 2017 5K iMac at 19,327 points. With Geekbench 4's graphics test, the 11-inch 2018 iPad Pro got a score of 42,270 compared to 31,259 on the 2017 model, so we're only seeing an increase of around 36 percent. The new 11-inch iPad Pro managed only a couple of thousand points behind the $2399 2018 15-inch MacBook Pro on the same graphics test, which scored 44,308 points. However, the 36 percent increase demonstrated by the Geekbench test is nowhere near the double graphics performance that Apple claimed during the keynote. 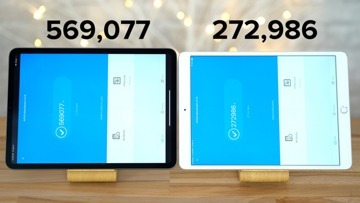 Expanding the testing to Antutu, the new iPad Pro scored 569,077 points, over twice the 10.5-inch iPad Pro at 272,986. 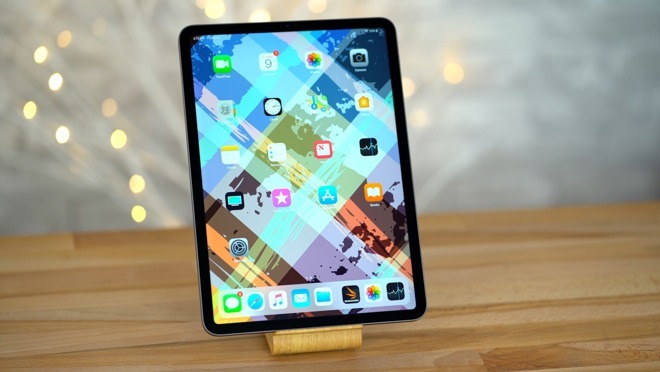 The new iPad Pro established a new record for the benchmark, which was previously set by the iPhone XS Max when it scored 363,000 points in our testing, so Apple is currently way ahead of the market in terms of phone and tablet processor performance. 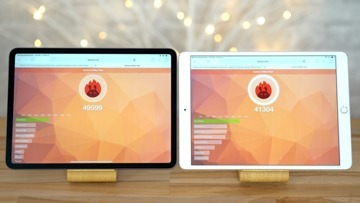 Running Antutu's HTML 5 test, the new iPad Pro scored 49,599 points compared to 41,304 on the 10.5-inch iPad Pro. This marks the highest score that we've seen from that particular test. 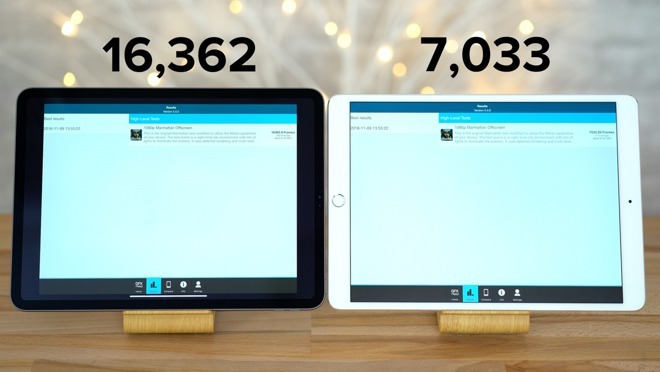 Using browser-centric Octane 2.0, the 11-inch iPad Pro scored 44,441 points compared to 33,850 on the older model. This is a notable increase in performance, but how much any given user will see this will vary a great deal on network conditions and what exactly is being rendered. 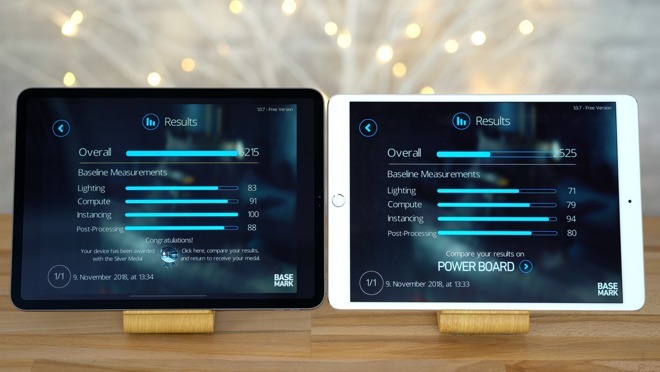 We then ran Basemark's metal graphics test, and the 11-inch iPad Pro scored 5,215 points compared to 2525 on the 10.5-inch Pro. This also lends crecedence to Apple's doubling of performance claim. Finishing off with our final graphics test, GFXBench's 1080p Manhattan offscreen test, the new 11-inch iPad Pro scored 16,362 compared to only 7,033 on the old model, substantially more than double the score. The 10.5-inch iPad Pro from 2017 was already outperforming so many other devices on the market, and the new tests only solidify that lead. To test the iPad Pro models' video editing prowess, we took a 1 minute 4K video shot at 60 frames per second, applied a filter and exported it to 1080P using Adobe Rush. 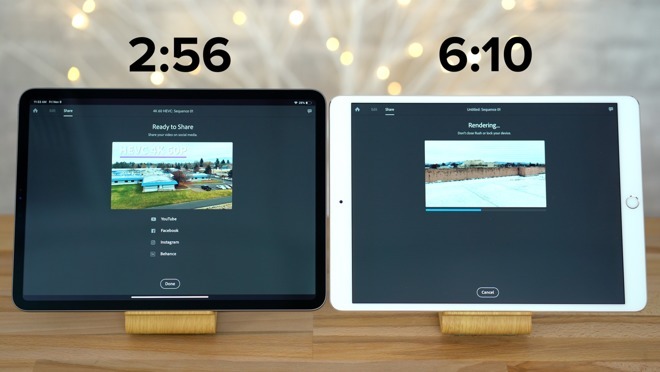 The 11-inch iPad Pro finished exporting in only 2 minutes and 56 seconds compared to 6 minutes and 10 seconds on the 10.5-inch iPad Pro, again more than twice as fast. Now for the photo editing, we exported 50 edited JPG images in Adobe Lightroom CC. 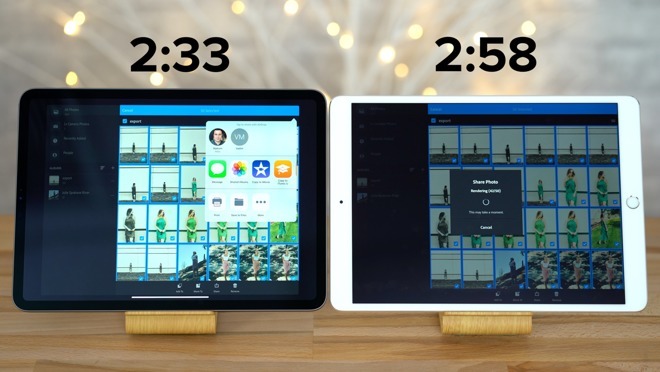 The 11-inch iPad Pro finished in 2 minutes and 33 seconds, while the 10.5-inch iPad Pro finished in 2 minutes and 58 seconds. There really isn't much of a difference here, even though the processor is much faster on the new iPad Pro. While editing the photos themselves, we noticed that the UI was more responsive and applying effects was noticeably faster on the new iPad Pro, but for this use case, the 10.5-inch iPad Pro was already fast enough for most users. Overall, we're extremely pleased with the performance of the new iPad Pro. We're seeing the equivalent of high-end desktop-level performance in a tablet that's only 5.9mm thick. These kind of numbers have reignited speculation that Apple is aiming to implement its custom designed ARM processors into the Mac lineup sometime in the near future. Apple authorized resellers offer a variety of perks on iPad Pro purchases, including no sales tax on orders shipped outside New York and New Jersey at Adorama, plus free shipping within the contiguous U.S. Shoppers can also take advantage of financing incentives with the Adorama Credit Card, such as no interest when paid in full within six months on iPad Pro orders over $500 —or no interest when paid in full within 12 months on iPad Pros over $1,000. With the holidays fast approaching, having a little extra time to pay off the purchase can be beneficial. For deals across all iPad lines, including dicounts of up to $150 off 10.5-inch models, be sure to check out our iPad Price Guide.